An enjoyable way to pass the drive to and from work. As others have written, this is the story of a young apprentice magician in an alternate England, dominated by an insular caste of wizards. 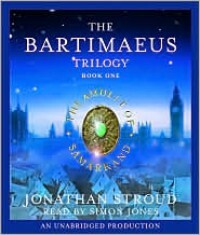 Nathaniel is a twelve-year-old boy and Stroud masterfully captures the egoism and selfishness endemic to that age; Bartimaeus is the amoral, cynical djinn summoned by our "hero" to take revenge upon Simon Lovelace and Nathaniel's master for humiliating him; and Kitty is a young Resistance leader who can see through demonic illusions and provides something of a moral compass. I certainly wouldn't mind actually reading this series at some point in the future, rather than listening to it.